You'll discover tucked-away gems like Tahoma National Cemetery and Hiram M. Chittenden Locks. Your cultural itinerary includes sights like Museum of Glass and Seattle Art Museum. 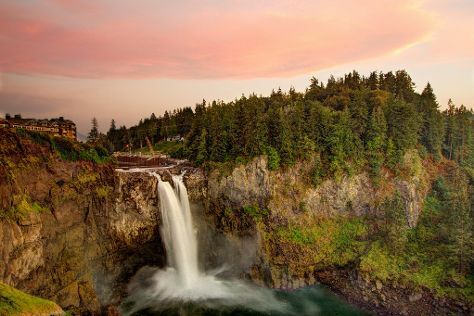 Go for a jaunt from Seattle to Snoqualmie to see Snoqualmie Falls about 58 minutes away. Next up on the itinerary: enjoy the sand and surf at Alki Beach, get in on the family fun at Seattle Great Wheel, stop by Starbucks Reserve Roastery & Tasting Room, and examine the collection at Museum of History & Industry. To see more things to do, other places to visit, traveler tips, and more tourist information, use the Seattle trip builder . If you are flying in from United Kingdom, the closest major airports are Seattle Tacoma International Airport and Boeing Field King County International Airport. Expect a daytime high around 30°C in July, and nighttime lows around 18°C. Finish your sightseeing early on the 4th (Thu) to allow enough time to travel back home.